If your list of New Year’s resolutions included saving money (perhaps for a down payment on a house? ), you might be wondering what kind of financial strategy works best. For some, it might include asking for a raise at work and putting the additional income aside. For others, it might mean cutting back on frivolous purchases. While both of these examples can certainly help, most experts agree that the best way to really save money – in a substantial and sustainable way – is not to simply rely on one or two methods, but to adopt a more frugal lifestyle altogether. Does this sound intimidating? It doesn’t have to be. In fact, by simply adjusting your way of thinking about money and implementing simple, healthier spending habits, you may be able to save a surprisingly large amount in an equally surprising amount of time. This shift can often begin in very simple ways, for example – saving on regular household expenses. In today’s post, we’ll go over 10 common household expenses and offer alternatives or tips for spending less on these recurring costs. It might not seem like you’ll be saving much when you first begin, but since these are expenses that you must regularly pay, the savings will surely add up over time. If you’re renting, it can be difficult to put money aside. After all, when you own a home, the money to pay toward your mortgage will ideally pay off when you build enough equity and sell the home. 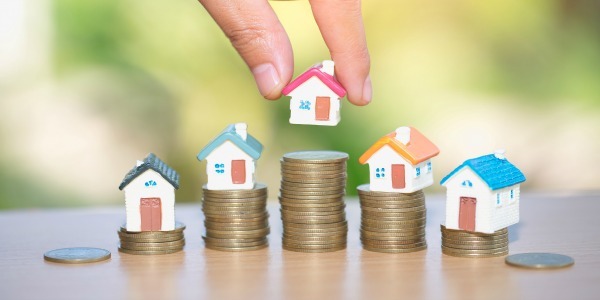 Renting on the other hand, is very often described as “throwing money away.” While that may be an extreme comparison, it is fair to say that when you rent, you’re not going to see that money return. So how do you cut rental costs? It’s not easy and sometimes not even possible, but it’s worth trying to negotiate your rental agreement if you have sufficient reason. Does your apartment have any problems such as leaks, pests, excessive noise issues, appliances that continuously break down, etc? These are all negotiating points, especially when it comes time to consider renewing your lease. If you currently own a home, but you’re finding it difficult to save money and selling your home is not currently an option, you may want to consider refinancing. By refinancing your mortgage, you could possibly get a lower interest rate, which would lower your monthly payments. If you have an adjustable rate mortgage, you may want to think about refinancing to a fixed rate structure. This will give you a solid, predictable mortgage payment that isn’t subject to change. This can be very helpful when planning your long-term finances and developing a savings plan. We all have to eat, right? Grocery costs have increased quite a bit over the years, so it would make sense to focus some of our thriftiness on this common household bill. According to the Labor Department, food prices have increased almost 5 percent in the last year, which is the highest annual increase in nearly 20 years. Fortunately, we have things like coupons and brand loyalty programs to help ease the financial burden. The unfortunate part however, is many people don’t remember to use these resources. If you haven’t already, sign up for your grocery store’s brand loyalty program. Not only does this make you eligible for special savings and sales at your store, but many of these programs offer extra savings perks on things like gas – another recurring expense for most. Reusable, reusable, reusable. Repeat this mantra to yourself before and during your shopping trip. The savings benefit here is pretty self-explanatory. With the ever-growing market of streaming entertainment via Hulu, Netflix, Amazon Prime and more, it may make more financial sense to cut out your cable tv package and opt for just high-speed internet. Most of these streaming programs offer affordable package options and lots of varied content. Even YouTube has some movies and TV shows on their platform for free. Just be cautious about where you get your content online and don’t engage with any content that seems suspicious or is clearly an copyright infringement. If you’re paying a monthly or yearly fee for any type of membership, subscription, etc. and you’re not actually getting any use out of it, cut it out of your life. This goes for gym memberships, magazine subscriptions, bulk store memberships, credit cards, and so on. Take a good look at what you’re spending on these recurring memberships and compare it with any savings or benefits you’re actually getting out of them. For example, let’s say you have a credit card with a $25 annual fee. If you keep the card for four years, that’s already $100 you’ve spent just for the privilege of having the card. Instead, consider canceling it (if you don’t have a balance). If you do owe a balance, make it a priority to pay it off and then cancel it. If you need to have a credit card, shop around for one that doesn’t charge an annual fee. It may not sound very effective, and it’s technically not a household expense, but keeping a jar of loose coins and regularly adding to it whenever you empty your pockets can help you save money over the long term. The key here is to designate that money for a specific purpose. For example, tell yourself that once you fill the jar, you’ll take it to the bank and put it directly in your savings account. Don’t fall for the temptation to spend it. After a month or two, you may be surprised to see how much money you’ve actually accumulated just from your change. The post 5 Ways to Save on Common Household Expenses appeared first on Mid America Mortgage, Inc..